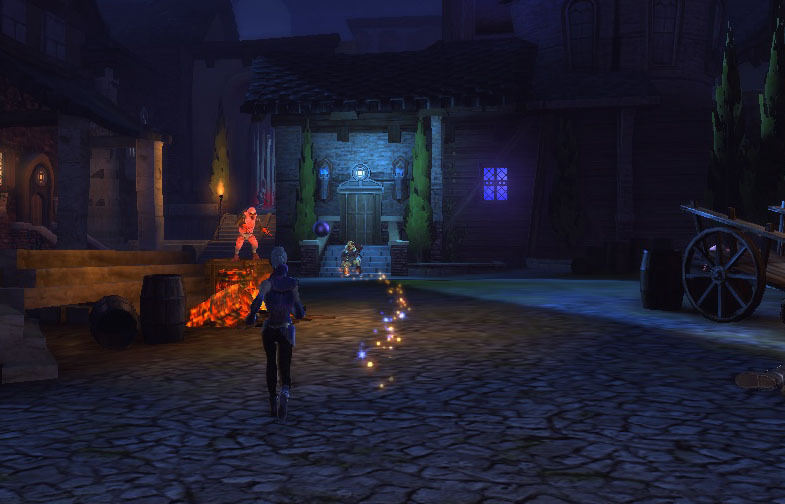 Last time I wrote about playing the Neverwinter MMORPG my impressions were based on the closed beta, where I played a Trickster Rogue. The game has officially launched now, so… what’s the verdict? To recap: here’s why I was excited about this game. I’ve never really gotten into a fantasy MMO before, and, unlike maybe 95 percent of the gaming population I’ve never played World of Warcraft. Any impressions you see here are coming from a refugee from City of Heroes, where we did the whole MMO thing a bit differently. But Neverwinter has one thing going for it that had me intrigued: Fourth Edition Dungeons & Dragons. Fourth Ed is still one of those polarizing games. Any time I mention that I loved it, I get a weird combination of high fives and deep hateful frowns. Having not moved onto Pathfinder with the 3.5 crowd, I stuck with the brand and, I thought, was rewarded with a fun tactical skirmish game with a fantasy skin. It’s certainly different from the older editions of D&D but what 4E brought to the table for gamers was a tactical combat system with lots of energy and player options. It was almost – some dared to say – like an MMORPG. Thus things have come full circle, bringing the legendary “tabletop MMO combat” back to the MMO. With the D&D brand slowly moving toward the more “oldschool” promise of D&D Next, the game that speaks clearest to Fourth Edition’s legacy is also going to be its swan song. This is Neverwinter, and it’s open for business. Combat in the MMO hasn’t changed much since beta. Wanting to try something a little different, I’ve started running a Control Wizard, and the play is still really fun. Point at things with the target and hold down the mouse to make them die, pretty much. The Wizard is a bit fragile, but she can lock down enemies with a whirlwind spell or by covering them in ice. There does seem to be basically just the one Control Wizard build – the ice build – so if you’re looking for huge variety among classes this game doesn’t really offer that just yet. Racial features offer some minor differences, and you can also choose a god to worship and a backstory, though this is purely for flavor. I’m pretty familiar with the lore in the Forgotten Realms, I’m invested in D&D as a whole, and I love game narrative. And yet I still find myself clicking through the game’s default quest text without bothering to read it. I know someone worked hard on that quest text and I should do my best to pay attention, but I, though I hate myself for it, don’t pay attention. And if I don’t, I’m betting most players don’t. However, quests are also fully voice-acted. This seems to be increasingly common and expected in MMOs. I thought at first this wouldn’t make much of a difference to me, but it’s actually nice that after I accept a quest, the sound drop lingers in my menu and I can keep hearing important information (as long as I don’t deliberately cut it off). That way I can get back in the game, and still get the lore that someone worked so hard on creating. Other lore drops take the form of text that appears in my menu which I can read at my leisure. I tend to let this go until I have some in-game downtime, so sometimes I have a hard time figuring out which lore is read and which is unread when I finally dive into the lore menu. If you don’t care about lore, the Fable-inspired glittery golden path (also present during the beta) hasn’t gone away, and generally will lead you easily to your next quest marker, no reading required. So what is different from beta? It’s tricky to say… and that was done on purpose. 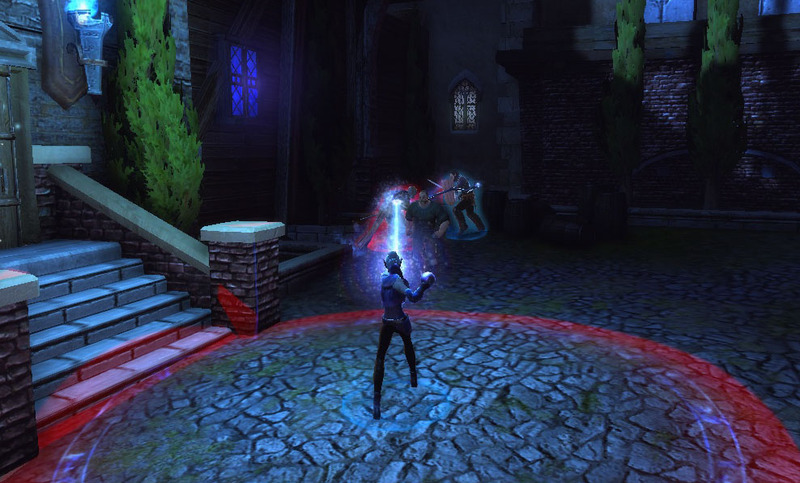 Neverwinter has been applying patches and balance tweaks for months, and did a “soft” launch on June 20. From all appearances this has confused some of the players. There was no post-beta wipe of characters or inventories following the open beta (though the closed beta was wiped). Since Perfect World was already charging players for mounts and gear and other in-game benefits, not taking away the stuff they paid for makes perfect sense to me. But be prepared for players to tell you that was totally not fair. I still feel like it’s fair. Also, the monetization seems pretty fair for a free-to-play game. There’s no gated content and there’s not really a strong sense that I can buy myself into a lot of power. I could spend a lot of premium currency on gear, but I’d still have to at least level up to the point where I could use that gear. You can buy mounts and a lot of crafting boosts; these things seem to be things you want just because you want them, as they’re far from required to handle the game’s main content. Crafting is a new system. The player can “hire” different types of artisans to create crafted items during downtime. In this way you can work your way up to new pairs of pants or chainmail or other gear. I’m not too worried about heavy armor on a Wizard, but that’s available from crafting too. There’s also Alchemy, a brand new crafting skill that allows the player to craft potions. The best profession boosts seem to cost premium currency but the whole thing is optional. There’s also an off-line menu that allows you to use your crafting skills when you’re not logged in… in case you want to make some quick potions during your lunchbreak at work. During Beta I caught a glimpse of the Nightmare, the shiniest of possible mounts, but there was no way to get her. Unsurprisingly, it’s a now a premium currency item, but there’s a twist. Play the game enough and you’ll receive Nightmare Chests. They’re just regular drops like anything else, but you can’t open them unless you have an Enchanted Key… which is of course a premium currency item. This is a bit like the Team Fortress 2 crates. You may get Twilight Sparkle in your box, but you’re more likely to get some other desirable, but not sparkly-pony-like, items. Other premium currency items are cosmetic things like dyes and different hire-able NPC companions. When I say the keys cost “premium currency,” in this case, I mean Zen, the real-money currency used in the Perfect World store. There’s also an in-game semi-premium currency in the form of Astral Diamonds, which can be earned through daily invocation, using the Auction House, or interaction with the Foundry quest-building system. Astral Diamonds are different from the coinage dropped by monsters and usually can be used to get better stuff. But if that didn’t seem like enough different currencies for you, there’s also Seals, which are tiered by level, Trade Bars which can be found in some item packages, and Honor… honestly this game has a dizzying and confusing array of currencies and items to trade. I’m frankly not really used to having to juggle gear in an MMO. It feels like my poor elf changes her slippers every twenty-five minutes or so, because she found some marginally nicer slippers. But in spite of the gear treadmill, characters don’t all look the same to me; there’s a pretty good array of customization with the different dyes and armor bits. Though collecting stuff seems to be the main objective, I think the Foundry is what will give the game longevity for me personally. I really wouldn’t feel like I’d played the game without having played a few Foundry quests and trying to create one of my own. The creation kit is actually pretty straightforward and reminds me a lot of the quest-creation tools that City of Heroes used to have. There’s only a small variety of map styles to choose from, but the maps can be altered in a 3D view to a large extent, with the addition of different objects and characters. With some clever manipulations structural alterations are also possible and teleporters can link one map style to another in the middle of a user-generated quest. 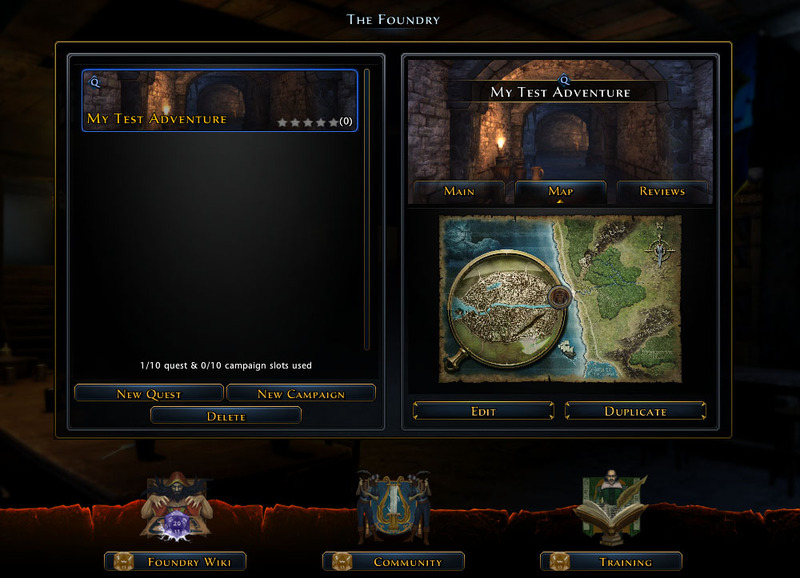 The game’s Daily Quest system is keyed to the Foundry, encouraging its use. I’m sure some players are using it by just farming the shortest missions, but I’ve chosen top-rated missions regardless of their stated length and I’ve generally been having a good time with the user-created content. Of course, it’s a total mixed bag, so be sure you read the description of a quest before taking the plunge. The game supports French and German-language quests as well as English. Teaming is smooth enough, and required for some of the more epic dungeons. But the action combat, and the ability to use a hireling NPC, make the game pretty solo-friendly. I’ve only worked with pick-up teams so far but I haven’t run into any issues finding a team when I needed one or confusions with the team building systems. I kind of love it. It shows a commitment to showing a diverse cast of characters and I can appreciate that. I don’t know if the game will replace my bi-weekly D&D game, but as an adaptation of the D&D system in general there’s a lot to like about it. 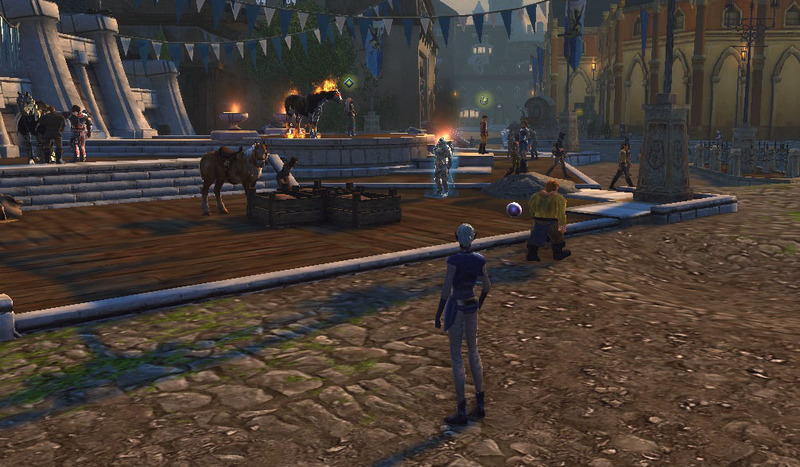 I can see myself spending a lot of my upcoming evenings in Neverwinter. Look me up on Dragon server, if you want to slay some orcs. I was going to say “leave me cold,” but that’s kind of unfair because I’ve never played one for more than a few hours. My longest experience with an MMO was the Guild Wars 2 beta, and that with a bad connection. I can’t say for sure if I like or dislike them; I’m kind of hesitant to try them, partly because I’ve managed to make a living in the business this long without a commitment to one, but mostly because I’m afraid to make a commitment one. I leave too many other games on the table to be comfortable with one dominating my time to that degree. I’m afraid I might enjoy them too much. But you make this one look awfully interesting, I must say! So as a person whose on-and-off 3.5 D&D group never made the switch to 4E, does Neverwinter do a good job explaining the system? A 4E noob could pick it up? Based on what you’ve written here, it sounds like Cryptic & Co have done a good job maximizing the business model of a free-to-play while minimizing the irritation to players. A rare balance – and my inner misanthrope also appreciates that it’s solo-friendly. I hope they do well, it’s a rough MMO market out there, but it sounds like Neverwinter deserves some attention. As a fan of 4E, I see the 4E influences, but as someone who only played 3.5 you won’t be confused, Steerpike. It’s actually a really straightforward battle system that has “at-will” attacks along with “encounter” and “daily” powers with longer cooldowns. There’s not much of a way to gimp your build so you’ll find it pretty easy to get the hang of. Sounds like they’ve carried over a lot of their monetization techniques and UGC stuff from STO, which is probably good, especially in the latter case. Although the damn lockboxes (or Nightmare Chests) might get annoying if they drop as often as they do in Trek. That said, if you can actually get Twilight Sparkle in one I would buy the heck out of the keys. I too am a newcomer to MMOs and after Guild Wars 2 which I still love and would love to play more of I’m realising that I’ll never really have time for them. My brother Lewis works over at Ten Ton Hammer and is entirely dedicated to them and even he said he was falling behind with some of the recent GW2 event content and if he’s falling behind what hope do I have? The thought of all those other MMOs, like Neverwinter, and the upcoming and quite frankly incredible looking Wildstar, and Elder Scrolls, and Secret World and Planetside 2 and FFXIV and and and– makes me feel queasy. Looking at those Neverwinter screenshots; I’m getting all sorts of Dark Age of Camelot vibes from it, which I played only briefly but found quite evocative in its own little way. I love the idea of MMOs a lot more than the actual play, as I simply don’t have time to keep up with anyone. So if/when I try to play an MMO, I might as well be playing by myself, as I don’t know anyone, and their interests in maxing out their gear leave me cold, as I’ll never come close to doing anything like that. I’m not sure if that’s a problem with MMOs or with my own inability to commit to them. I suspect it’s some of both, as other games–Demon/Dark Souls come to mind, manage to create online environments (though not of course MMOs) while avoiding the time sinks. Since I gave up on WOW some years back, I’ve started a whole lot of MMOs, but haven’t gotten far into any of them. Except maybe CoX, and we know what happened to that. Sigh. It’s sure not for lack of interest. When my son (now about to turn 7 (!!)) was born, I dreamed of teaching him to play WOW, to build his comfort with computers and his vocabulary. But he’s proven much more interested in watching–except for games like Limbo, The Cave, Little Big Planet (hey at least he’s got good taste). So I don’t know what ever will pull me back to them. Retirement maybe. If my kids don’t kill me first. Ha!